Ireland West Airport is delighted to announce that Mayo & Roscommon Hospice Foundation, Down Syndrome Ireland and the Children's Medical Research Foundation Crumlin have been selected by airport staff as its charity partners for 2018. A number of events will take place during the course of 2018 which will engage passengers and staff with the aim of raising as much money as possible for the three charities. 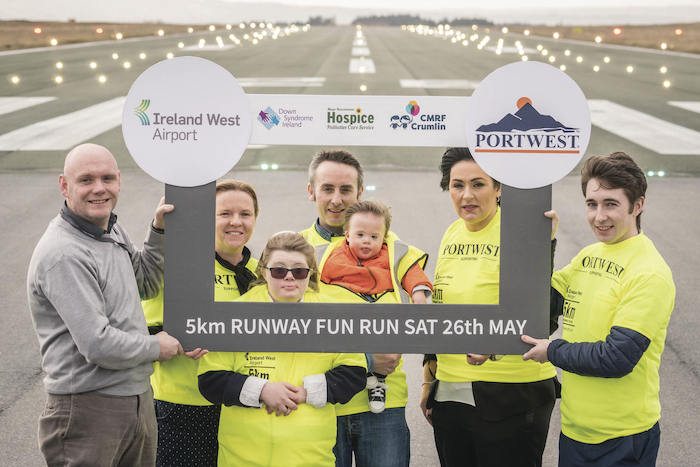 The headline event for 2018 will again be the annual charity 5k runway fun run which will take place on the runway at Ireland West Airport on Saturday May 26th 2018 at 7pm. The airport is delighted to welcome local Mayo business, Portwest as the new headline sponsor for this years event. Runners and walkers will take-off down the runway at 7pm and complete a 5km course with a difference. All are welcome to attend what promises to be fantastic evening for all the family, raising much needed funds our three charities in 2018. Entry to the event costs €20 per adult and €5 for under-16’s. A special family rate of €40 will be available for families of 2 adults and 2 kids. All participants will receive a race t-shirt and complimentary car parking and refreshments at the airport will be provided on the day. Participants can sign up and find more information by visiting www.irelandwestairport.com/runwayrun The number of participants is restricted and those interested are advised to register early to avoid disappointment. Would you like to be on the hospital Patient Council? Page generated in 0.2019 seconds.